Here is the first of a two-part article on frequency modulation (FM). FM was a very welcome option for entertainment radio listeners who had grown weary of static mixed in with their music and syndicated adventure, drama, and comic programs like The Green Hornet, Lights Out, and The Life of Riley, respectively. Amplitude modulation (AM) is susceptible to all sorts of interference from car ignition systems, arcing in electric motors, light switches being turned on and off, lightning, and a host of other sources. A commercial radio with good noise and adjacent channel rejection was relatively expensive. Permanent magnet speakers did not become a standard feature for first few decades of radio (see my 1941 vintage Crosley radio speaker for an example), so the speaker coils themselves ended up carrying a lot of the same static biases that the sound signals contained. Combine far-away transmitters because of wide spacing between broadcasting facilities with poor receiver sensitivity and the opportunities for interference was large. FM solved most of the problem both because it inherently was immune to amplitude modulation from noise and because by the time it entered the commercial market, component and circuit design had advanced considerably from the early AM days. As author Raymond Guy puts it, "Frequency Modulation is a weapon against noise, a sword if you please, with advantages which can be calculated accurately and simply." 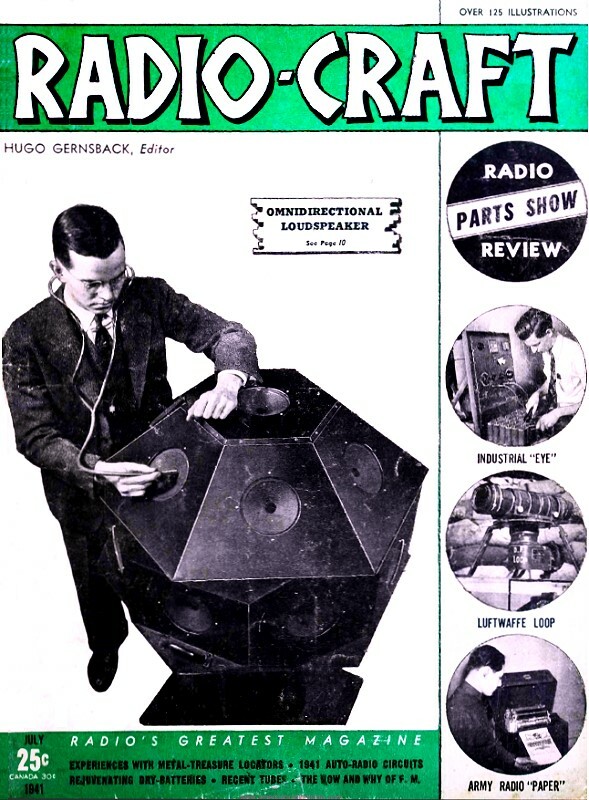 By special permission of the Association of Technicians, Radio-Craft here presents an article on F.M., from the A.T.E. Journal, which covers the engineering aspects of Frequency Modulation more completely than any previously published in Radio-Craft, and does it in a thoroughly understandable manner. Part I, presented here, generalizes on the topic and discusses the results of measurements made on the transmissions of N.B.C. Station W2XWG. Fig. 1 - "W2XWG's field intensity pattern in micro-volts/meter (irrespective of the type of modulation). These measurements represent a power of 1,000 W., a transmitting antenna height of 1,300 ft., a receiving antenna height of 30 ft. and an operating frequency of 42.6 megacycles." There is widespread belief that many present-day developments are fundamentally new within the last few years. On the contrary, the bases of many so-called new developments date back a great number of years. It is true, however, that only recently has it been possible to utilize to fuller advantage the possibilities of many of the ideas passed down to us by early investigators of the Radio Art. New instrumentalities have made it possible to explore these fundamental ideas to much greater extent. Transmission and reception at ultra-short wavelengths, or ultra-high frequencies, is one such outstanding example. The use of the ultra-high frequencies for sound broadcasting offers technical advantages, not only to the broadcaster but to the public, which is much more important. The technical advantages consist of (a) escaping the 10-kc. channel limitation, (b) getting away from static. and (c) eliminating all except spasmodic long-distance interference. We've known this for years, have experimentally operated low-power U.H.F. stations since Way Back, and have enjoyed the experience of receiving Clean Stuff from our little ultra-high frequency transmitters when QRN, with devastating wallops washed out our temporarily muscle-bound 60 kw. steamrollers. Five years ago the F.C.C. had applications for, or had licensed over 100 ultra-high frequency transmitting plants and it seemed that a trend was developing toward ultra-high frequency broadcasting, but this trend was not sustained. Interest has been revived in recent months through the promotion of F.M. on the ultra-high frequencies. Frequency Modulation is a weapon against noise, a sword if you please, with advantages which can be calculated accurately and simply, as we shall see. But unreasonable powers should not be attributed to it. The pen should not be mightier than the sword. Your scribe bows low and humbly attempts, with these hesitant strokes, to bring to you gentlemen of the A.T.E. Journal what the Lower Classes vulgarly call the Lowdown. A snack of ins ide dope. Let's get to the point. What advantages does F.M. really give over A.M.? Using the frequency deviation approved for the industry by the F.C.C., F.M. Under the Optimum Conditions gives (a) an advantage of 20 to 1 in background noise suppression, (b) an advantage of at least 30 to 1 in rejection of shared-channel interference, depending on the beat frequency, and (c) some advantage to the broadcaster in capital expenditures and operating costs. There you have it. One frequently meets laymen who have the mistaken idea that F .M. is a revolutionary new invention. The justly proud father of your profoundly humble scribe bought him his first lace velvet pants in 1902. Most of you were still unborn during that antediluvian era. It was in that year that a gentleman named Ehret applied for a patent which was issued in 1905 covering the basic method of F.M. for voice and code transmission and reception! Mr. Ehret proposed to shift the carrier frequency by means of a voice-actuated condenser. He proposed an off-tuned circuit in the receiver for converting the frequency-modulated waves into waves of varying amplitude. With certain improvements these are the methods now used. For code signaling he proposed to key the transmitter inductance or capacity to change the carrier frequency. Before the No.1 war this method was very widely used for many years on longwave transmitters. Remember how .discombobulated one could become by trying to read the back wave when fatigued? Frequency Modulation research. has been carried on for over 30 years and, except for 1918, 1920 and 1924, patents have been issued on F.M. methods and devices each year for the last 25 years. They were granted mostly to a number of inventors in the employ of organizations which spend large sums on research, such as G.E., Westinghouse, A.T.&T. and RCA, and to a few individuals, particularly Major Edwin H. Armstrong who has promoted use of the feature of "wide swing" in F.M. Other features are important in F.M. such as limiting. Gentlemen named Wright and Smith filed a patent application covering, it 15 years ago. Fourteen years ago, and subsequently, patent applications were filed and granted to Westinghouse. A.T.&T. and RCA on balanced, or "buck-to-buck" F.M. demodulators. The most commonly used discriminator today was patented by S. Seeley of RCA. Frequency multiplication of an F .M. wave to increase the frequency shift is covered in patents issued to Westinghouse, and G.E., for which applications were filed in 1926 and subsequent years, High frequency pre-emphasis and de-emphasis circuits were patented by S. Seeley and others of RCA. Its introduction to the industry was due in considerable part to the efforts of N.B.C. At the close of 1939 more than 250 patents had been granted on either Frequency or Phase Modulation, of which more than 160 covered F.M. About 10 years ago R.C.A.C. was trying F.M. on channels between our East and West Coasts. About 12 years ago your scribe cooperated with Westinghouse in F.M. 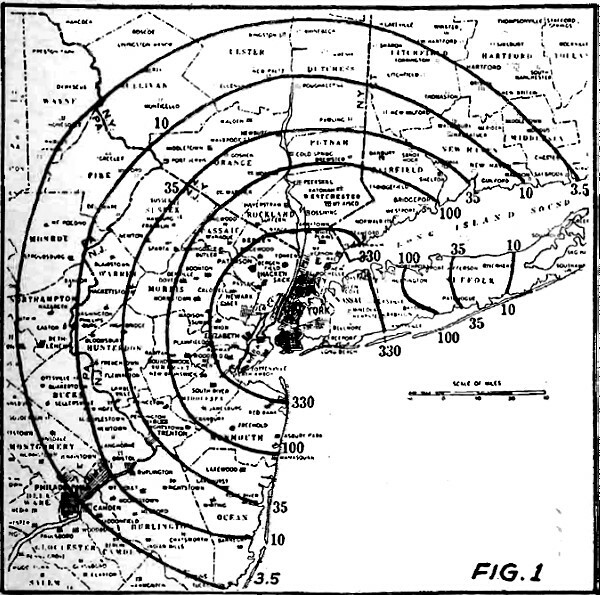 tests between New York and Pittsburgh. So you can see F.M. isn't new. There is a popular impression that by use of F.M. and "wide swing" the public may only now enjoy high fidelity. The facts are that with ultra-high frequencies the fidelity can be made as good as anyone wants it to be with either frequency or amplitude modulation. Any improved fidelity is made possible by getting a way from the 10-kc. channel allocations of the Standard Broadcasting Band and not by using F.M. Furthermore, to get "high fidelity" in A.M. or F.M. receivers the listener must pay exactly the same high price for high-power, low-distortion audio amplifiers, loudspeakers and acoustical systems. However, the time may come when High Fidelity will receive the widespread recognition it merits. There is much more interest now in low receiver prices which preclude high fidelity. This is unfortunate but incontestably true regardless of any wishful or idealistic thinking to the contrary. There is no lack of satisfactory fidelity in present-day transmitters because, if for no other reason, the F.C.C. requires it. The loss of fidelity rests in the home receivers. Medium-priced receivers satisfy the public demand and high fidelity cannot be obtained in those models. The price paid for so-called high-fidelity amplifiers and loudspeakers is in itself more than the cost of most receivers. Possibly 1 person in 6 has a receiver of good fidelity. Many of these listeners normally operate with the tone control adjusted for the lowest degree of fidelity possible with such receivers. It appears that the public is not suffering any lack of fidelity because of the present broadcasting system. Frequency Modulation would under favorable conditions, but not all conditions, reduce static about 20 to 1. But what static are we talking about? Static practically doesn't exist on ultra-high frequency. Therefore. isn't its absence mainly due to the shift to the ultra-high frequency band? It is. Don't think that your humble servant is bearish on F.M. because that would be incorrect. It is cold professional realism, not bearishness. An F.M. station will provide noise-free service to a much greater distance than an A.M. station of equal power because F.M. can suppress receiver hiss noise, auto ignition noise and other ultra-high frequency disturbances about 20 to 1 if the carrier is stronger than the noise and if the receivers have enough gain to make the limiters limit at low field intensities. Some F .M. receivers begin to slack off at about 100 microvolts. To obtain the full benefit of F.M. out to the "noise threshold" limit they should hold up down to 10 micro-volts. This noise threshold is strictly an F.M. phenomena; more on this later. We are all confident that Television has a most brilliant future. We are not entirely clear on the position that Ultra-High Frequency Sound Broadcasting will have with respect to it. Those of us who have lived with television for many years feel that sound is supplemental to sight but definitely second in importance. When television hits its stride, sound broadcasting may assume the status of silent pictures. Who knows? Nobody does. In any event, sound broadcasting will be with us for many more years and we should give full opportunity to improved methods and devices. F.M. is one of them. N.B.C. has one F.M. station and will build more. F.M. is being given its chance to prove itself. The N.B.C. has for many years viewed realistically the advantages of the ultra-high frequencies and has been confident that the industry would, in time, do likewise. Five years ago Mr. Hanson and your profoundly humble scribe wrote a long report on the subject forecasting the growth of ultra-high frequency Sound Broadcasting by 6-month intervals and hitting very close. Frequency Modulation had such promising theoretical advantages that we undertook a full-scale field test to determine the extent to which they could he realized in practice. As a result we completed, last year, at a cost of over $30,000, the most thorough field test of F.M. ever undertaken and we have the information we sought. It was obtained, not by laboratory work, which had been done before by others, including R.C.A.C., nor merely by operating an F.M. station, but by building special transmitters, receivers, measuring instruments, etc., and then painstakingly making thousands of measurements at distant points over many months and under a variety of conditions. 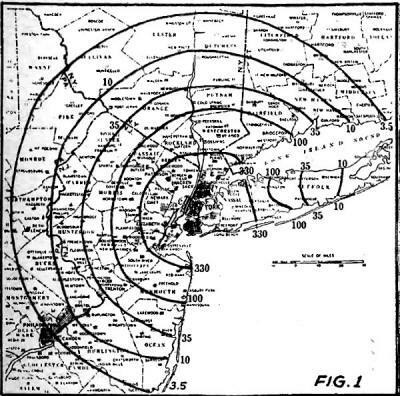 A special 1,000-watt transmitter was ordered from the R.C.A.M. Company. It had facilities for both A.M. and any degree of F.M. deviation or "swing" desired, with remote control facilities for instantaneously switching to either system. Since the F.M. deviation varies directly with the audio input level, remote controlled pads could be and were used to select the deviation desired. W2XWG was installed in the Empire State Building. Special authority was obtained from the F.C.C. to use amplitude modulation as well as F.M. on 42.6 mc. for the term of the project. The television video antenna, having a pass band extending from 30 to 60 megacycles, was used for most of the W2XWG transmissions although a special folded dipole was used when the video antenna was transmitting "pictures." W2XWG was equipped with means for continuous variation of power between 1/10 watt and 1,000 watts, and a vacuum-tube voltmeter for accurately measuring the power. The modulation conditions selected were A.M./F.M. 15 (deviation of 15 kc. or total swing of 30 kc. ), and F.M. 75 (deviation of 75 kc. or total swing of 150 kc.). 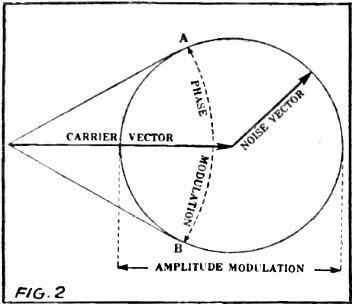 Tone modulation was used for most measurements. For measuring distortion, or noise levels with modulation present, the tone output of the receivers was cleaned up by passing it through filters and then impressed upon RCA noise and distortion meters. Four special receivers were built by the R.C.A.M. Company for this project. Each was equipped for instantaneous selection or A.M./F.M. 15 or F.M. 75. Two complete I.F. systems were built-in, one 150 kc. wide and one 30 kc. wide, each having 6 stages, with both A.M. and F.M. detectors. All receivers contained meters, controls, de-emphasis circuits with keys, 8-kc. cutoff filters with keys, separate high-quality amplifiers and speakers, cathode-ray oscillographs, etc. Each receiver had sufficient R.F. gain to give full output with limiting at input levels much lower than required, theoretically doing so with only 1/10·microvolt input. These receivers were made as good as receivers can be built in order that our conclusions on F.M, would not be clouded by apparatus shortcomings. Sacrificing good receiver design to price will not permit the full gain of F.M., as reported herein, to be realized. All above stations are temporary, with the exception of the last two, which are permanent. As a part of the project, a field intensity survey was made of the W2XWG transmissions. The map is included herein for 1,000 watts, 1,300 feet antenna height, and 0.7 antenna gain. It is Fig.1. Most of the measurements were made at the Bellmore station. For the temporary stations, 2 automobiles were equipped and used, one a Radio Facilities Group measuring car, the other a borrowed R.C.A.C. truck full of recording gear. The receiving stations represented a cross-section of rural and suburban Americana. Let's next see what theoretical advantage F.M. has in noise suppression and how it is obtained. Later we will see what we measured. In. F.M. the deviation of the carrier frequency can be made as great as desired. If it is 15 kc. and the audio bandwidth is 15 kc. the deviation ratio is 1, corresponding to the deviation divided by the audio bandwidth. If the deviation is 30 kc. the deviation ratio is 2, etc. (1) The triangular noise spectrum of F.M. (2) Wide swings, or large deviation ratios. (3) The greater effect of de-emphasis in F.M. compared to A.M.
Let Us consider them In order. An F.M. system with a deviation ratio of 1 has an advantage in signal-to-noise ratio of 1.73 or 4.75 db. for hiss or other types of fluctuating noise. Since the figure 1.73 applies to such noises as tube hiss, which is comparatively steady in amplitude, we will consider this type of noise. It differs from impulse noise such as is produced by automobile ignition systems. Tube hiss consists of a great many closely overlapping impulses or peaks, There are so many of them at all audio frequencies, we are concerned with, that the noise has a steady characteristic. When combined with a steady carrier of fixed frequency, the noise peaks beat with the carrier. The noise peaks also beat with each other. When the carrier is considerably stronger than the noise peaks, beats between the noise peaks become negligible in amplitude and the predominating noise is due to the combination of carrier and noise peaks. Since a combination of 2 carriers differing in frequency produces a similar phenomenon, we will treat both cases at the same time. The effect is most easily shown and understood by means of a simple vector diagram. The strongest carrier vector continuously rotates through 360° and is indicated on Fig. 2. The weaker carrier, or the "noise voltage," rotates around the carrier vector at a frequency which is equal to the difference between the desired carrier and undesired frequency. It will be seen that amplitude modulation is produced. 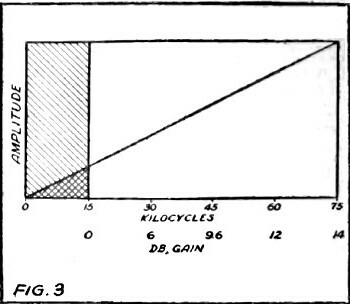 If the undesired frequency is 50% as strong as the desired frequency, 50% amplitude modulation results. As the undesired vector rotates around the desired vector, phase modulation also is produced between the limits A and B. The faster the undesired vector rotates, or the faster the rate of phase change becomes, the greater becomes the momentary change in frequency and therefore, the greater the frequency modulation becomes, because Frequency Modulation is a function of the first differential of phase modulation. Therefore, the amplitude of the frequency modulation noise or beat note varies directly with beat frequency. With both frequencies exactly the same there is no amplitude modulation nor is there any frequency modulation. Such being the case, the noise frequencies close to the carrier produce little frequency modulation noise but as the noise components further from the carrier combine with it they produce more frequency modulation. Therefore, the higher the noise beat frequency the higher its amplitude. This results in a frequency modulation noise spectrum in which the noise amplitude rises directly with its frequency. In other words, it is a triangular spectrum. In amplitude modulation there is no such effect as this. All noise components combine with the carrier equally. Therefore in amplitude modulation there is a rectangular noise spectrum. The ratio of noise voltages in F.M. and A.M. is therefore the ratio between the square root of the squared ordinates of a triangle and a rectangle. This ratio is 1.73 or 4.75 db. For an F.M. System the suppression of fluctuation noise is directly proportional to the deviation ratio. On Fig. 3 the A.M. noise spectrum corresponds to the total hatched area below 15 kc. because the I.F. system would cut off there. The F.M. 75 receiver I.F. system actually accepts noise out to 75 kc. and it has the usual F.M. triangular characteristic. However, the receiver output and the ear responds only to noise frequencies within the range of audibility, around 15 kc., and rejects everything else. Therefore, the F.M. 75 noise we actually hear corresponds only to the small cross-hatched triangle and and the rest is rejected. The maximum height of this F.M. triangle, corresponding to voltage, is only 1/5th of the height of the A.M. rectangle. Such being the case the F.M. 75 advantage is 5 to 1, or 14 db. Simple?